An independent contextual platform for knowledge sharing and communication between built environment professionals. 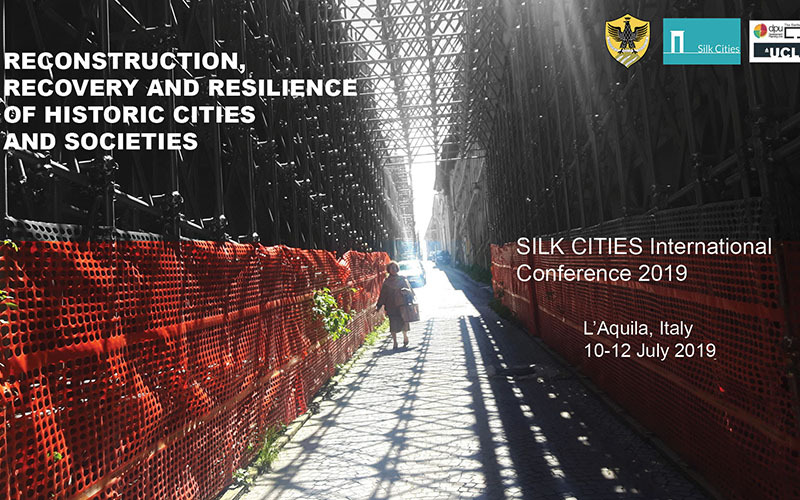 Silk Cities is an independent, bottom-up and not-for-profit professional and academic initiative, concerned with contextual urban challenges that countries along the historic Silk Roads face within the process of urban transformation. By using the narrative of the urban Silk Roads we tap on the notions of connectivity and exchange, historical presence that is reflected in city characteristics and urban life, and contextual contemporary challenges. Silk Cities’ initial focus area has been these cities in the Middle East and Central Asia connected to their regional and global contexts. The Beta version of Silk Cities was initiated by Farnaz Arefian, a DPU doctoral researcher at the time in 2014 and DPU's honorary research associate now. The DPU will provide a number of conference grants for students from low and middle income countries in order to assist their participation in the conference. Details on the selection criteria and submission of applications is available in the Silk Cities website (link). The deadline for applications is 15th April. In order to reflect on this we have decided to extend the general abstract submission period until 15th April. In a post-crisis situation, the interrelation of historic urban context, cultural heritage, social, psychological and economic factors presents a highly complex scenario for decision makers, practitioners and affected local populations. This is a matter of increasing international concern which has been highlighted by recent disasters of both natural and human origin, from Kathmandu to Mussel, from L’Aquila to Aleppo and more. Beyond monuments, having dynamic layers of urban heritage greatly increases the complexities of urban reconstruction and retrofit which per se is a complex matter and connects with all aspects of urban life and development before and after the crisis, initial expectations and envisioned improvements from the reconstruction activities and the way they are managed. The multidisciplinary nature of the conference fit within the UN Habitat III agenda, the Sendai framework on disasters and resilience and the themes of the International Committee on Monuments and Sites [ICOMOS]. This will be the third Silk Cities international conference and it is designed to address the issues surrounding reconstruction in historic cities at two levels. At a wider level, the conference seeks to influence the way in which risk is considered in historic cities and to promote a holistic approach to resilience which takes account of social, cultural and psychological factors. At a local level the conference will provoke conversation and reflection on the rebuilding work already carried out and consideration of the next ten years of reconstruction and recovery in L’Aquila. The Conference will provide an opportunity to bring together the voices of various local stakeholders in L’Aquila as well as academics and practitioners. The three day conference will be part of the series of events marking 10 years from the earthquake, and open to all, it will encourage participation of the citizens of L’Aquila many of whom have been active participants in initiatives aimed at social reconstruction. • Reconstructing cultural heritage and rediscovering civic identity. • Heritage-oriented reconstruction vs reconstruction-oriented heritage restoration. • Linking urban development processes and reconstruction processes. • Big data in reconstruction: potential and limitations. • Information technology and smarter reconstruction. • Communicating urban heritage and reconstruction. • Transparency and communication in decision making. • Who is cultural heritage for? • Public engagement and civic participation. • The audience for reconstruction: local or global? • Cultural heritage as a stimulus for recovery. • Narratives of approach to disaster and recovery. • Social, psychological and economic recovery. • Linkages between reconstruction process and socio-economic recovery. • Economic and political stimuli for urban recovery. • Information technology and the resurgence of historic cities. • The role of information technology in city recovery. • Social media disaster response policies and practice. • Rebuilding confidence in the capacities of the city. • Tourism and heritage cities. • Knowing the city, owning the city. • Engaging the next generation: reconnecting younger citizens with heritage. • Risk communication and public awareness in in historic cities. • Cultural heritage as a mean to building resilience. • Smarter cities, data sharing and risk modelling. • Information technology and civic resilience. The conference programme will comprise a mixture of formal presentations, specialist roundtable and dedicated sessions, a guided tour on the reconstruction of L’Aquila, as well as a social tour and an optional conference dinner. All designed in a way to encourage social interactions and informal discussions and exploring future potentials. Round table discussions are planned which will bring academic participants in the conference together with policymakers, local activists and stakeholders to look at strategies for recovery and resilience. Guided tour of city centre, includes visiting completed, ongoing and non-commenced reconstruction works including public and private examples, public spaces, schools and churches. Programme details will be announced in due time. Tentative conference programme is as follows. The historic city of L’Aquila is easily accessible from Rome and Pescara. For detailed information on Silk Cities 2019 please visit www.silk-cities.org.